Xyron for a fabulous and fun blog hop this week! and we love their products! Be sure to join us each day and leave a comment!!! We have prizes up for grab and you do NOT want to miss out! Hello everyone! 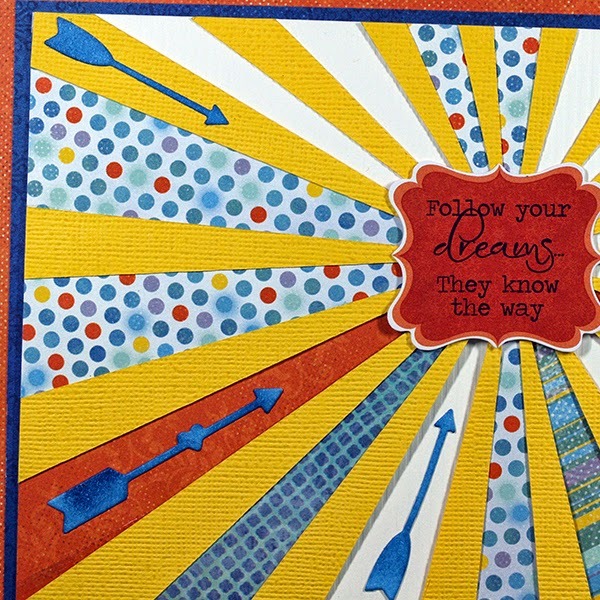 Barb here to share a layout I created with Quick Quotes new Calypso Line and Xyron Adhesives! What a fabulous combination!! It is very rare that I can get a photo of my daughter and son together, smiling! So, when that rare occasion happens, I have to take advantage of it and get it on a layout! And since this hardly ever happens, it explains why I only had one photo to work with! I love this particular sheet of paper from the Calypso line. It is perfect for a background piece! 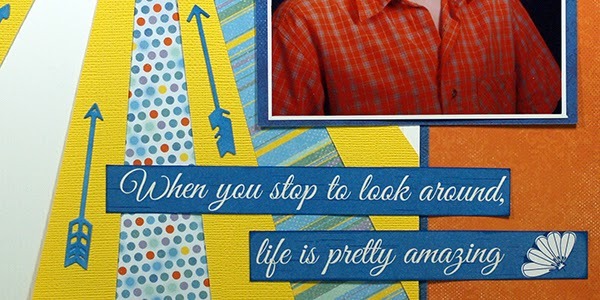 The quote on this layout was cut from the Calypso 500 paper that is full of quotes! Since I really dislike coming up with titles for my layouts, this is a great solution for me! I used the Xyron glue stick to adhere the dark blue flower like die-cuts behind it. The 1.5 inch "X" Sticker Maker worked perfectly for adding the felt flowers! I even used it for the sequin! 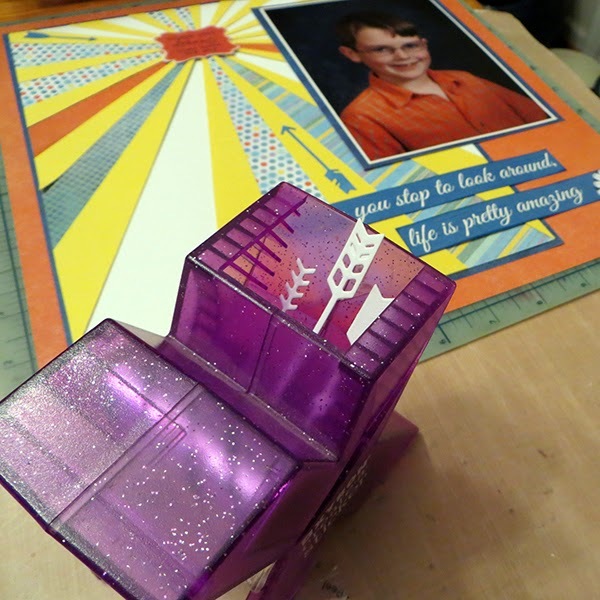 I loved using the Xyron Mega Runner to adhere all the layers of papers on my layout! It was easy to use and held the papers well! I really love the chipboard die-cut stickers that coordinate with the Calypso line! 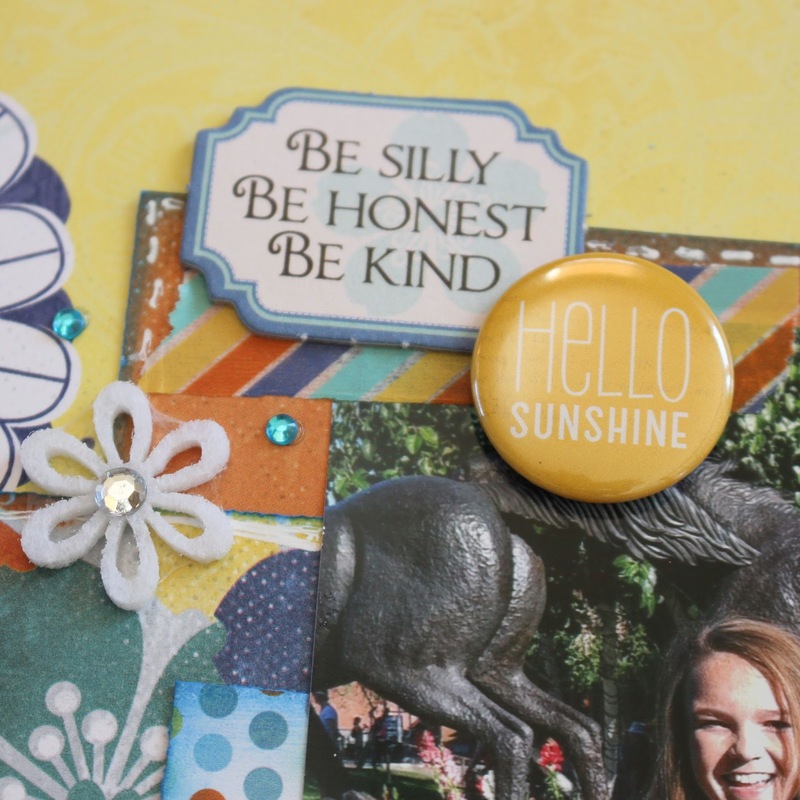 They are the perfect little embellishment to add a little personality to your page! 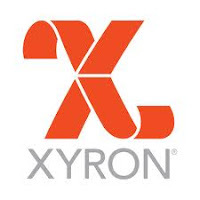 Thanks so much to Xyron for the opportunity to work with your wonderful adhesives! Hi there! Susie here today with a layout featuring the Calypso collection and of course some wonderful Xyron adhesives! The colors and the vibe in the Calypso collection were a perfect match to my son's 4th grade school photo. The die cut yellow cardstock was a gift from a girlfriend. I simply added some pieces from different papers in the Calypso collection before I positioned it on white cardstock, matted it with blue and placed the die cut sticker in the center of the "burst"! I loved using the Xyron Sticker Maker to add the die cut arrows to the layout! It made it so easy! When the arrows came out of the sticker maker I took a pencil and outlined the shape of each one before I removed the cover sheet. Sometimes adhesive can be a little string-y, and this simple step really helps to minimize that! The next step was to color the arrows with Quick Quotes Blue Moon Powder Puff Chalking Ink. It was so easy to do this because the arrows were still stuck to the backing! No worries about tearing or damaging the delicate shapes. I peeled the arrows off of the backing and adhered them around the layout. 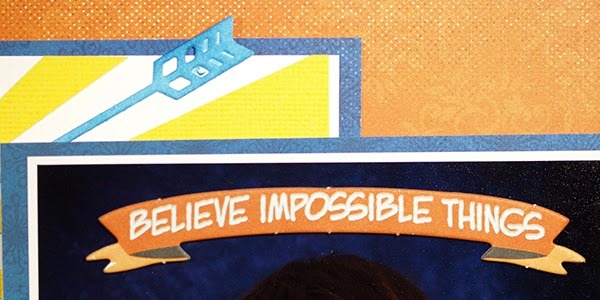 I used the Blue Moon Ink to edge the journaling strips below and then adhered them with a Xyron Tape Runner. 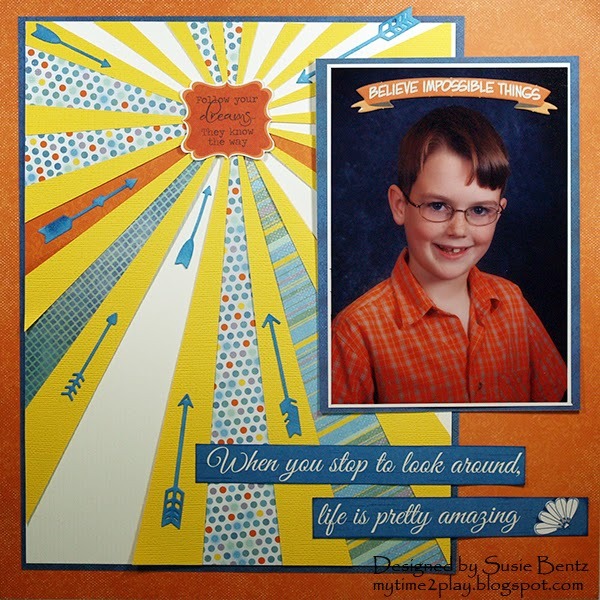 I often feel like they leave too much "head room" in school portraits, so I was very happy to fill the space with this banner from the Calypso Chipboard Die Cuts. Thanks for stopping by and a special Thank You to Xyron for their awesome adhesives! I hope you find some time to play today! All winners will be announced on Saturday 6/1. Great projects! I love them and I love Quick Quotes I was just at a Mini Reserve and I loved it I'm thinking about doing another one in Milwaukee WI in October. And Xyron rocks too! very fun layouts!! Great shares! I signed up to become a follower thru e-mail. the layouts are great. I love the amazing sun in the second and the pretty flower corner on the first. The quotes are so fun. thanks for joining with Xyron for the week. I really like the pencil tip (pun intended!). Gorgeous projects and love all the tips and ideas!!! Found you via "Ain't She Crafty". Loving these 2 pages and the idea for coloring items. I use my Xyron machines a LOT but never thought of that tip! Looking forward to more inspiration. Great layouts! Quick Quotes teamed with Xyron, what a great combination! Great layouts using Quick Quotes and Xyron products. Beautiful layouts, love the papers and elements. Xyron and Quick Quotes are the perfect match. Becoming a follower right now. Love Xyron & Quick Quotes. My name is Lyn Kaufmann and I'm following by e-mail. Oh, how I absolutely love these layouts! I seem to get stuck in a particular way of scrapbooking, and this is very refreshing! Haven't used either product before, but definitely looking into it now! Thank you! Beautiful layouts ladies!!! I love how completely different they are even though you both used the same paper line! That's one thing I have always loved about QQ! Can't wait for tomorrow's post! Love both layouts! I really love the Silly quote, it's very cute. I think I'll be checking out Quick Quotes alot more now.Thanks for pairing up with Xyron. Thanks for the chance to win! 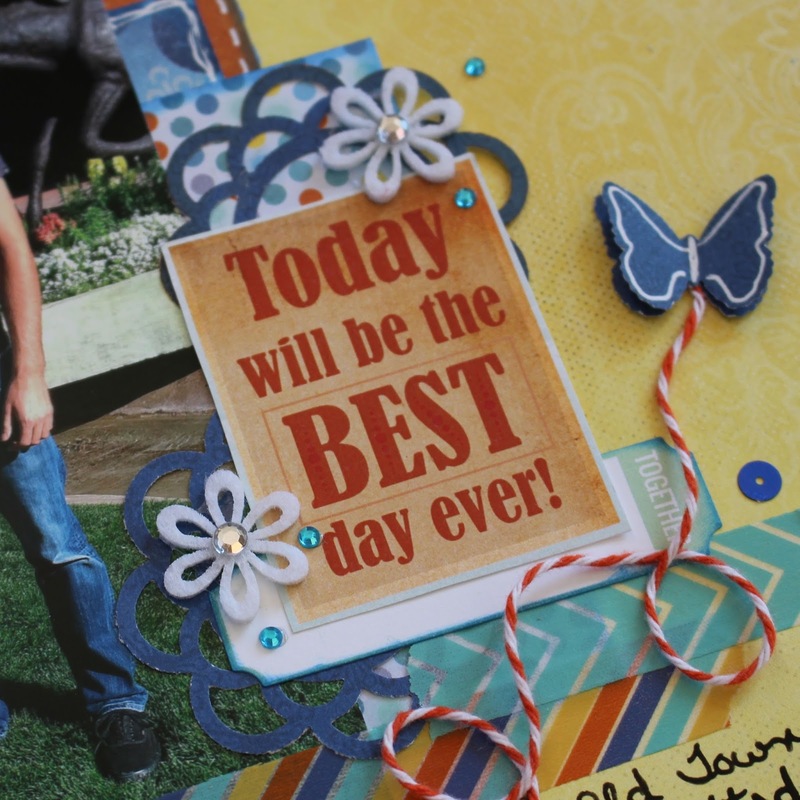 Beautiful layouts, love the layering and embellishments! I really enjoy seeing all the wonderful posts using your Blog Quick Quotes line of products. Thanks for sharing with us. Fabulous projects! Super inspiring and I'm excited to get to join in the fun with you and Xyron! I'm new to Quick Quotes and very happy to have discovered you! Your products look wonderful and so handy for my crafting needs! Yay! Looking forward to this week! Beautiful layouts. Love the papers and that ink. Such wonderful inspiration! Love the arrows!